South Carolina's Katherine (K. Lee) Graham captures the 2nd Miss Teen USA crown for this universally successful state joining the ranks of Tennessee and Texas which each also have 2 Miss Teen USA winners and Oregon boasts 3 Miss Teen USA winners. South Carolina's 1st win was in 1998 thanks to Vanessa Minnillo, who is now married to Nick Lachey who has also performed at Miss Teen USA 2000 with his group 98 Degrees and Vanessa is currently pregnant with the couple's daughter after having one son together. South Carolina is also the only state to haVe 2 Miss Universe winners (Miriam Stevenson who won Miss USA then Miss Universe in 1954 followed by Shawn Weatherly in 1980), Lu Parker also won a 3rd Miss USA crown for South Carolina in 1994. Gina Tolleson won the Miss World crown in 1990 after placing 1st runner up at Miss USA 1990. It is also to be noted that K. Lee is the first Miss Teen USA to be the daughter of a former Miss Teen USA contestant and this is what makes this win even more delicious since K. Lee Graham is the daughter of Miss South Carolina Teen USA 1985, Jennifer Neuen who did not place among the semifinalists when she competed for Miss Teen USA 1985 won by the legendary noted actress Kelly Hu of Hawaii. Other legacy stories include Miss Teen USA 2005, Ohio's Allie Laforce who is the daughter of Miss Ohio USA 1977, Lesa Rummell and Kristen Dalton, Miss USA 2009 who is the daughter of Jeannine Boger, Miss North Carolina USA 1982. 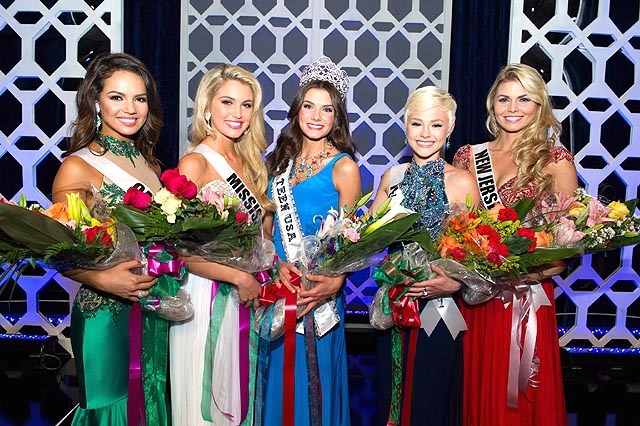 Although these winners' mothers did not place in the semifinals at their respective pageants, these moms must be so incredibly proud of their daughters who not only made the semifinals but went all the way to win the crown! The hosts this year were Erin Brady, Miss USA 2013 and Karl Schmid who returned after last year and both did a fine job. After the top 15 were announced and a quick runway session, it was on to the swimsuit competition. Indiana had a good look overall and seems quite smart so I had no objection to her placing. This was a very competitive year so there were any number of delegates that could have placed for whatever reason. Oklahoma also really had that teen look and a great figure also so she was a great choice also. The breathtaking Vaeda Mann of Mississippi followed looking so perfect. She has the classic long blonde hair and a great body with long legs and indented waist. Keep your eye on Vaeda as I'm sure there are great things in store for her in the future. Tennessee was up next and Tennessee teens are normally of a higher standard. This year's delegate was only an honorable mention in my list because I felt her overall enthusiasm and attitude wasn't particularly as high but she does have a decent body. She was followed another beauty in Lexsey Marrara of West Virginia who has a doll-like face and great body. I was very surprised that she didn't advance to the top 5 as she was just sensational. El próximo delegado fue Meeess Nueva Jersey y... Ella es!! So Nueva Jersey was represantandoed by the muy fabuloso Valentina Sanchez. She previously held a Teen Model Venezuela competition so maybe contestants like her will draw in more of an international audience to Miss Teen USA that is sorely lacking. She is obviously very tall with a wider frame but her hips don't lie! She makes a man wanna speak Spanish. Como se llama (si), bonita (si), mi casa, Valentina, Valentina... I didn't think her look would fly at Miss Teen USA but she did have the backstory of her mother and grandmother's suicides so this must have helped her. I thought the blonde hair looked wrong on her though. I think maybe a few highlights would have looked a bit more natural perhaps. Next up was our winner, K. Lee Graham of South Carolina and that distinct abbreviation of her name surely helped her to stand out. She also was very well prepared as is typically expected of South Carolina's delegates. K. Lee has a great figure with long legs and is very fit complemented with her lovely, flowing brown hair. 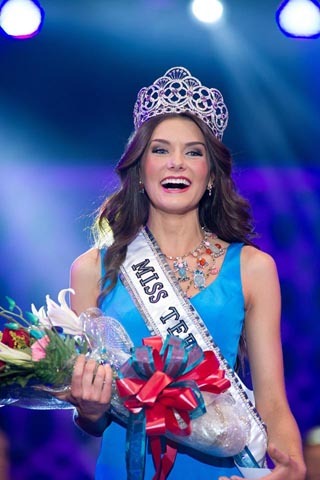 Texas' Kellie Stewart placed but Texas hasn't been shown a lot of love at Miss Teen USA because believe it or not, this is only the 2nd placement for Texas in the last ten years at Miss Teen USA. Their other placement was also a win by Danielle Doty in 2011 which is highly unusual for this very competitive state that easily boasts the most Miss USA winners as well as 2 Miss Teen USAs so it was refreshing to see Texas back in the mix. Kellie was tall, blonde and very fit and she does speak very well so she was deserving of a semifinalist spot. Delaware followed and this is the 3rd placement for Delaware at Miss Teen USA after 1995 and a win in 1999 yet this state remains the only state to never place at Miss USA. Mia was very fit and also had the long legs and great waistline and she literally was the next choice for me as she narrowly didn't make my list. She was in my list at one point but then I wrote several lists before deciding on a final one. I was waiting to see her gown and her gown didn't impress me and that's why she fell out but she was good. She showed that she has a great personality in her close-up video. Pennsylvania followed and Sydney was a heavy favorite this year. She had a very fresh, teen look and the short hair really helped her to stand out so it was no surprise to see her do so well. Arizona followed and Savannah also had a great body and lively presentation. She enjoys Saturday Night Live and maybe she will be a comedienne one day as she loves Kristen Wiig. Wisconsin followed and she was okay but was not expected to place by most people including myself. There was a time when her close-up video was blocked on YouTube for no reason and then it was back up so I think maybe that had something to do with her placing but she was also a decent delegate. As mentioned previously, this was a competitive year. Next up was Michigan's Iris Robare who being on Student Council and being chosen over 1500 students to represent her state at the Conference on National Affairs made her an accomplished standout and therefore semifinalist material. She reminded me a lot of Tami Farrell, Miss Teen USA 2003 in her close-up video and she seemed very likeable with a great body so she was absolutely a worthy semifinalist. California followed also looking okay and finally, Massachusetts easily had the loudest crowd support even during preliminaries. I don't necessarily like it the judges cater to one delegate because of the crowd support over some delegates that may not have as much crowd support so that is a bit of a turn-off for me personally since it takes away from the fairness. I firmly believe Massachusetts' loud crowd support is why she placed and especially why she called last of the semifinalists because a loud cheering crowd will also drown out the disappointment of the supporters of the many other delegates that did not place. This was followed by Erin Brady interviewing the other reigning queens, Nia Sanchez and Gabriela Isler speaking about the Miss Universe Cordaid fund started in the Philippines for people affected by typhoons and various natural disasters. After a lovely gown parade matching the delegates by gown colors, it was time for the evening gown competition. Indiana was first and dared to wear a black gown which often isn't associated with Teen but I felt that she pulled it off very well. I think black is actually a great color for evening gowns because you really focus on the girl and with her blonde hair, I think Indiana really looked great and it had a fluffy design skirt which just made it Teen appropriate so it was a good choice. Oklahoma followed in a gown with a gold sparkling bodice and white skirt. This gown reminded me a lot of the gown Shauna Gambill wore when she won Miss Teen USA 1994 but it also echoed those of Erin Brady at Miss USA 2013 and Tiana Griggs at Miss USA 2014 in terms of the color. Next up was Mississippi in a heavenly flowing white gown and of course, Vaeda looked sensational like an angel descended from Heaven. Tennessee followed in one of the many green gowns but it flowed so nicely and the judges obviously recognized this and rewarded it. West Virginia followed in a cherry red number that really accentuated her great figure and that stunning face and that beaming smile, she looked like she would skyrocket into the top 5 but alas, it was not to be. Nueva Jersey lució un vestido rojo precioso. Her presence is pretty undeniable on stage. South Carolina followed in a unique accessorized light blue gown that obviously worked well for her seeing how she won in it and all. Texas was dazzling in a sparkly light-blue number. Delaware followed and this gown was actually what took her out of my list as I didn't particularly like the ruffles below the bodice. Pennsylvania followed in a really nice, darker gown with the jewelled bust and had a cuff-neck which is a style that I really like. She carried it well. Arizona followed in the notorious two-piece gown and she did worked it well. Wisconsin also had a fairly unique purplish gown almost of an older century that she threw around on stage to catch your eye. Michigan looked sweet and charming in white. The gown didn't look like it fit too well in the middle but it was a very nice gown regardless. California followed in another green gown. This gown also caused her to fall on my list as I didn't feel it was the right choice for her. The sheer bodice didn't match her skin tone and maybe a different color like navy blue would have worked better. Massachusetts followed in yet another green gown with jewelled bodice. When watching preliminaries, I observed that there were way too many green and red gowns this year and I entirely blame this year's top 2 at Miss USA, Nia Sanchez and Audra Mari for this trend! I think delegates should try to be more original when it comes to their gowns. There were a few two piece gowns conveniently covering the navel but even then they come across as more costumey and risqué to me for Teen and they don't really flatter the waistline. Alabama, Arizona and Virginia all sported these gowns but Arizona was the one who placed. After intermission, we cut to the top 5: California, Pennsylvania, Nueva Jersey, Mississippi and South Carolina. Before the final question, there was a more casual question round. California being an avid reader was asked what book she would recommend. She recommended a book called 'The Kite Runner' written by an author who lives in a town near her. It's a book about war from a civilian's perspective. Being a political science major, the whole war and political aspect was interesting to read about war since seeing it from a civilian's side of it was new and allowed her to feel empathy and compassion for the character. Pennsylvania was obviously asked about her short hair. She said she had it short for 7 years and is lazy when it comes to doing her hair so one day she decided to cut it off and it stuck with her ever since. Nueva Jersey ganó una award este año nombréd the Monarch Award and she was asked qué es? And suddenly her reason for making top 5 became very clear. She has been working with mental health association in her state for the past two years since she lost her mother and grandmother to suicide and she wants to help people realize that suicide is not the solution and that there is hope. She won the youth spokesperson for the mental health association and she won the award. I thought after bringing this up that there was no way she would be 4th runner up but I guess not. Mississippi followed and was asked what the People to People student leadership conference was since she was picked to represent her state in that and Vaeda in all her gorgeous gorgeousness responded that it was a leadership conference for student ambassadors all over the country and they travelled to Washington, D.C. and visited the Whitehouse and worked on their public speaking and ways to be a leader in all kinds of situations and it was just a little getaway to learn a lot about the country. Finally, South Carolina was asked the obvious question - the reason for abbreviating her name from Katherine Lee to K. Lee to which K. Lee accredits her older sister who, at age 1, couldn't pronounce her name so they shortened it to K. and it stuck and it fits her now! That unique name is probably what helped stand out to the judges also. Then it was down to business with the judges' questions. California was first and was asked by judge Amber Katz, "If you were invisible, where would you go and what would you do?" California responded, "Wow. That's a really good question. Um. If I was invisible, I think I would want to... Let's see... I might actually want to go to the Whitehouse. I... One of my favorite shows is the show 'Scandal'. It's about, um, you know, the inner workings of the Whitehouse and I'm a political science major and I do want to pursue P.R. but I eventually want to do Political P.R. and so I'd want to see the inside workings and how things really work." It was a decent answer. Pennsylvania picked Dr. Joseph Parisi who asked, "Parents often host after-prom parties for high school students because they would rather have their kids drink at home. What are your thoughts on this?" Pennsylvania responded, "I don't believe that's okay just because if it's not your kid, I don't think you should be serving them alcohol. I think you should follow the law and what that has to say so I don't think that's okay." It was the obvious answer but she delivered it very succinctly and I like how confident Sydney is when she speaks. Nueva Jersey picked Chriselle Lim who asked, "A lot of teens say that body image is one of their biggest struggles. Do pageants make this better or worse?" Nueva Jersey replied, "Well, I believe that beauty is not defined by your size, your shape or your color of the skin. Uh. For me, beauty pageants, um, they have helped me to improve my public speaking abilities, my confidence. I feel more beautiful than before and I think that every girl should do a pageant at least one time in her life because it's an amazing experience. Thank you." Bravo, Valentina on such an amazing answer from someone who obviously doesn't have English as a first language. No way would I have ranked her 4th runner up after this answer. 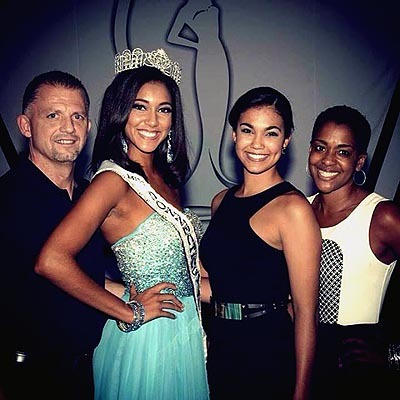 Mississippi followed picking Fred Nelson who has judged Miss Teen USA many times and he asked a question written by reigning Miss Teen USA, Cassidy Wolf, "what are the pros and cons of teens being so reliant on their cell phones these days?" Vaeda replied, "Well, one of the definite pros is the ability to share with all kinds of people. I know that I have friends and family following me right now especially during this crazy time and if it weren't for my phone, I wouldn't be able to keep them all updated with all the exciting things. But one of the cons definitely is maybe a decrease in your social speaking skills because so many times, I'll glance over and see two people on a date and they're both on their phones and I'm like, 'You're not learning anything now. You're on a date right now!' so I definitely think that's a con but there's pros as well." I loved how Vaeda made this question fun and light-hearted. Not only is she so gorgeous but she's extremely charming also. Finally, South Carolina picked Mallory Tucker who asked, "100 years from now, how do you think people would describe teens from your generation?" K. Lee replied, "Well, I'd hope they'd say that we were a generation of change. I think that now you definitely see a lot of change coming. A lot of technological advances and I think you also see a lot of different social changes happening as well so I'd hope that we leave a positive impact and that I'd hope that we'd leave an impact that said, you know, we were forward thinking." Also another very good answer. This definitely was a competitive year and the answers from the top 5 were strong. Pennsylvania won Congeniality and Alabama won Photogenic. After Cassidy Wolf gave a very emotional farewell, it was time to announce the final results. The 4th runner up was Nueva Jersey, 3rd runner up was California, 2nd runner up was Pennsylvania and then it came down to the final two: Mississippi and South Carolina and I felt so sure that Mississippi had it that I was in shock that they announced South Carolina as the winner. I just could not believe the judges let an amazing girl like Vaeda go and have to settle for 1st runner up. Maybe they didn't want to crown two long-haired blondes in a row? In any case, hopefully Vaeda will come back for Miss USA one day as she was just outstanding and has great potential there. But we do have a great queen in K. Lee Graham of South Carolina who will do a fine job as Miss Teen USA.